The slogan Yuva Hunkaar expresses a powerful agenda and a call to action. Yuva (meaning “youth”), attached to the term Hunkaar (roar/shout out/loud call) expresses a forceful, clarion call for social change. It’s a roar to action on issues of systemic discrimination against India’s marginalised and oppressed. In 2014, the newly elected BJP government promised jobs, jobs, jobs. These have not materialised. Modi’s India is a highly unequal place. The so-called “Gujarat model” of neoliberal development and its failure to generate jobs, escalating violence against Dalits and Muslims, and the unjust incarceration of those that dare to speak out – such as Chandrashakhar Azad – are all firmly in the cross hairs. Last Tuesday’s rally was well attended, given the systematic disinformation campaign mounted by sections of India’s corporate media and the Delhi police. Fake stories were run about cancellation of the rally, the Delhi police suggested that key speakers were banned from attending, and the aims of the protesters were downplayed as self-interested, “anti-national”, and divisive. Extreme social conservatism and rampant corporate greed have become the order of the day under prime minister Narendra Modi – rubber-stamped by a potent combination of the BJPs formidable electoral machine and huge support at the ballot box. In 2014, the newly elected BJP government promised jobs, jobs, jobs. These have not materialised. Modi’s India is a highly unequal place. India is a country where, in full phallic splendour, the most expensive private residence on the planet rises out of Mumbai’s up-market Cumbala Hill, while less than a stone’s throw away, deep seeded urban poverty shapes the lives of the majority of Mumbaikars. A 2017 paper by economists Lucas Chancel and Thomas Piketty, shows that rapid increases in the level of inequality in India are such, that, today, inequality is approximately the same as it was in the 1930s under British colonial rule. An ominous precedent indeed. Across the nation, BJP big wigs decry the Muslim “population bomb”, and display a chilling eagerness to settle scores through fanatical violence, with seeming impunity. Across the nation, BJP big wigs decry the Muslim “population bomb”, and display a chilling eagerness to settle scores through fanatical violence, with seeming impunity. Last spring, upper caste violence directed against the Dalit community in Shabbirpur village, in western Uttar Pradesh (UP), resulted in the mass burning of villages, houses and shops. Cue silence and in-action from the maniacal “mini Modi” Chief Minister of UP, Yogi Adityanath. The clashes, according to Yogi, were ‘a well planned conspiracy’ staged by militant Dalit groups. Under the BJP, religious tolerance has deteriorated, with minority communities – Muslims and Dalits in particular – increasingly subjected to defamation, discrimination and extreme violence. Predictably, India’s upper caste ruling elite, in cahoots with the corporate media, has attempted to twist the significance of Yuva Hunkaar – screening pictures of empty chairs and declaring the rally a “dud”. Instead, they have preferred to mount a relentless propaganda campaign of slander against the movements most prominent and vocal organiser Jignesh Mevani. In December 2017, Mevani, a social activist and Dalit leader, successfully contested and won a seat in the Gujarat Legislative Assembly. 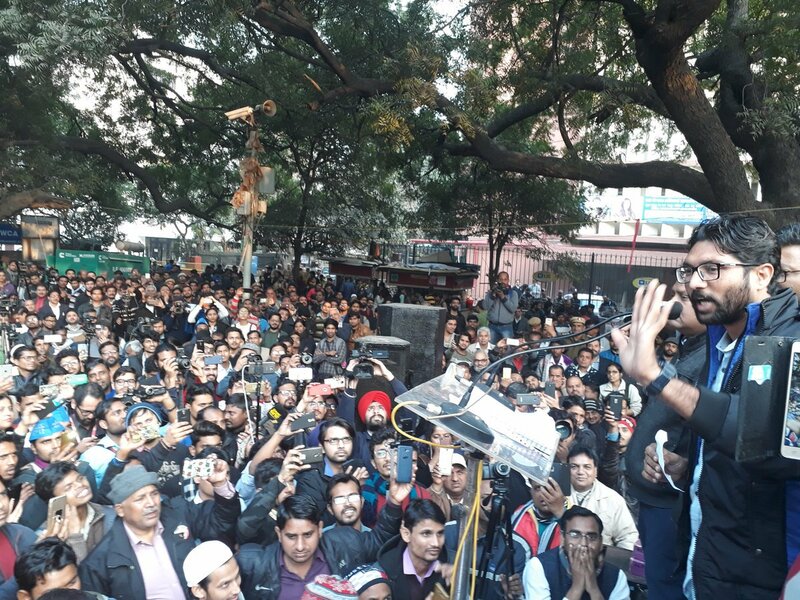 Since his rise to prominence, Mevani’s core message has been simple yet highly effective: the future of India hinges on a choice between constitutional democracy – upholding the rights of all Indian citizens – or the BJP’s decisive program of Hindu populism, authoritarian violence, and rising inequality. As a result, Mevani has been branded a terrorist and stooge of Pakistan, charged with playing the caste card, inciting violence, and propagating a toxic brand of divisive, anti-national politics. Of course, it doesn’t take a genius to realise that the focus on Mevani, is part of a strategy to downplay the diversity of the movement as a whole – an attempt at divide and rule in the classical mode. Mevani is clearly passionate about fighting the everyday injustice faced by Dalits. Yuva Hunkaar aims to form a bridgehead for political organisation across regional, religious, and caste boundaries, in favour of a secular, socialist democracy. However, it is crucial to note that the fury of the Indian establishment and the rabid media campaign against him, in large part, owes to his skilful oratory, and potent combination of Dalit assertion with a wider politics of class. As Sagarika Ghose points out in an excellent blog post for the Times of India, the power of Mevani’s challenge is that ‘his war cry of Dalit pride, equality and assertion, undercuts the united Hindu identity’ that the BJP is so keen to promote. Yuva Hunkaar aims to form a bridgehead for political organisation across regional, religious, and caste boundaries, in favour of a secular, socialist democracy. The rise of India’s new youth politics appears to have rattled the BJP. The Modi landslide in 2014 was powered to a large extent by poor and unemployed youth, especially in India’s northern states. In the coming months, the objective of the BJP establishment will be to curb and suppress the dissenting voices that are rising out of this demographic. Meanwhile, on the streets, the present convergence of youth leaders and social forces presents an ideal opportunity to politically organise India’s marginalised and oppressed, with the 2019 elections on the horizon.